Yes, that is 100% pure cuteness! Talk about a girl cake smash y’all!! 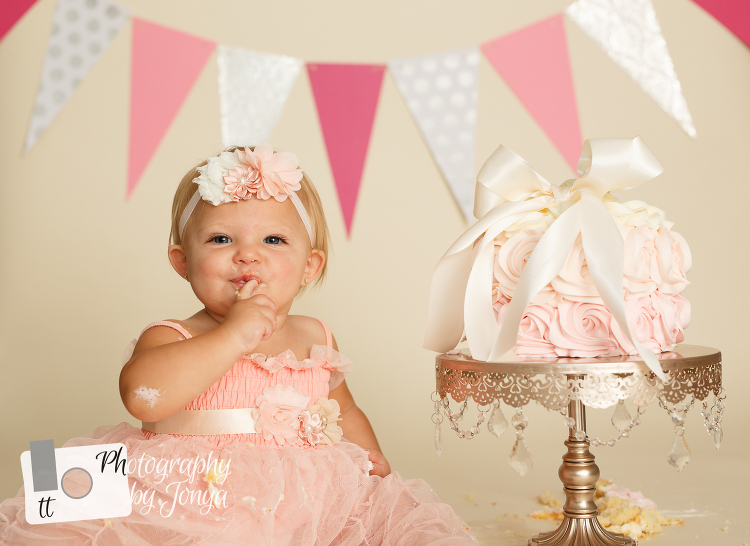 Everything about Hannah’s cake smash session was girly and beautiful! Everything from the blush pink dress with a precious puffy tutu skirt, to the satin sash on her belt that matched the satin ribbon placed on the cake, to the fancy silver cake stand with jewels draping on the side, to the ombre pink and cream buttercream frosting on the cake, to the pinks and textures in the banner… it was wonderful! This cake smash session was inspired by a previous cake smash session I did a few months ago. That session can be found here. The cake for the smash session was made by the same baker, Baked by Billie. The difference in the cakes is merely a different bow. Once she started to get used to the frosting on the cake, she was so playful and so stinkin’ cute! If you look closely at the photo above, she was crawling with handful of cake. The other striking feature this sweet little girl has are those piercing blue eyes. Not one of these photos included any editing of the eyes. They are just that blue .And her eyelashes go on for miles. One of the funniest things was when she would lose a chuck of cake that she had grabbed from the cake in the tutu. Its didn’t stop her from grabbing another handful and trying again. 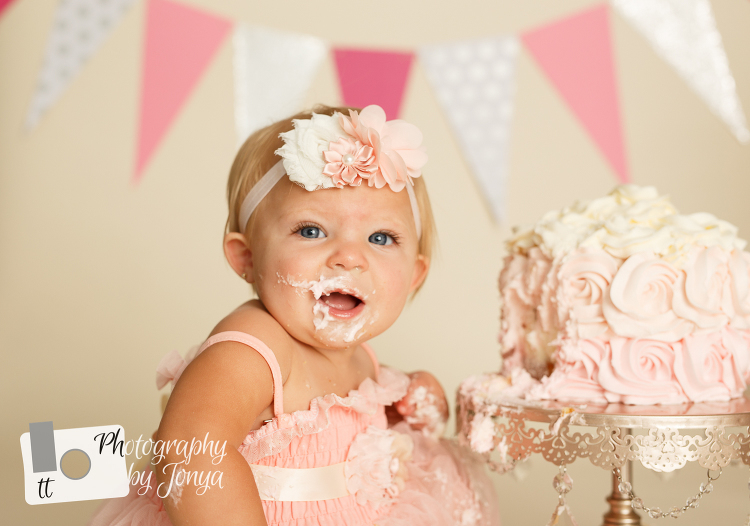 I had so much fun documenting this first birthday with this cake smash session for this little girl.